Launched in Japan in 1908, KAI has been manufacturing knives for over a hundred years and produces some interesting product ranges. 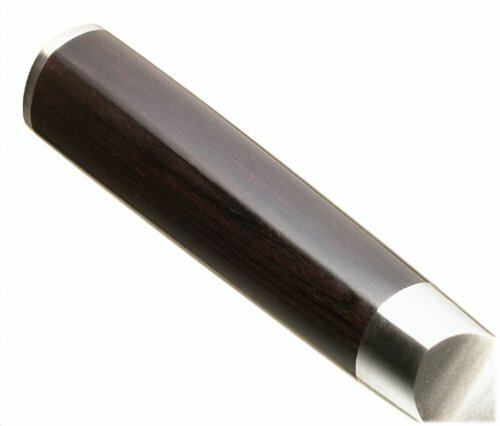 They have a good reputation and use very high quality materials in their knives, giving excellent corrosion resistance and strength. They, like most Japanese knife makers – base their techniques in the ancient Japanese art of Samurai sword forging. Presented in an elegant wooden box, this 3-piece knife set is a great gift for a keen domestic chef and is evidently of a very high quality. From KAI’s Shun series, these knives come with a great reputation as well as sleek presentation. Firstly, these beautiful knives have an undeniably Japanese look to them and feel fantastically weighed and solid in your hand. The metal has a sleek finish and the blades are exceptionally sharp and stay that way for a really impressive amount of time. The aesthetic design of the knives is simple and fluid – no fancy styles and no spurious shapes, just straightforward class. I like this aspect of the knives a lot and the handles fit the palm of your hand comfortably and smoothly. Extended use of these shouldn’t bring much discomfort at all and they are a good weight, not too heavy, not too light. Although the sharpness lasts through a lot of wear, when they do need sharpening they sharpen easily and retain their fine shape. The blades are very adept at slicing, chopping and peeling and should be treated with the utmost care. The Office knife (why is it called that?) is a really great, precise tool that I just love to use. Its point is razor sharp and you’ll find fine, accurate use is seriously pleasurable. It’s a trust worthy knife that you’ll use every day. The Utility knife is quite long at 15cm and the cook’s knife is a standard 20cm; they are both fantastic at their jobs and I’m not sure I could ask for anything more. This set is particularly good for a 3 piece as the knife are just the perfect three lengths from each other. They are definitely the 3 core knives you’ll need in an average – enthusiastic kitchen environment and will be great replacements for old, poor knives or perfect to start a truly high quality collection. KAI Shun knives are created from 32-layer damask stainless steel and are corrosion-resistant and extremely hard. They are reliable sturdy in the hand and retain their sharpness well. Theoretically, as with Richardson Sheffield knives and a few other brands, you shouldn’t really need to replace these; they should be a lifetime investment. The 3-piece set is a great way of investing in high quality knives without committing to a full set just yet. 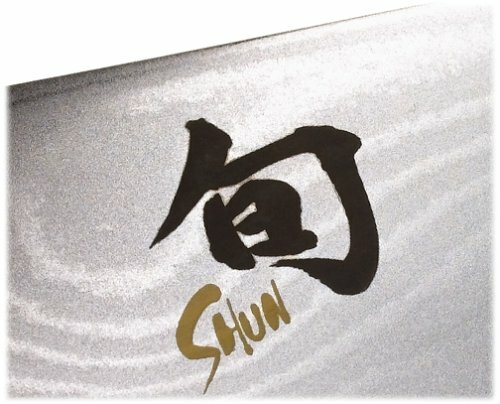 It will give you the opportunity to see whether you like the style of Shun knives and from there you can always pad out your collection with more of their fantastic products. Elegant, straightforward Japanese knives made with outstanding materials and designed impeccably. What’s not to love? For most domestic chefs, these three knives will be the most used as so it could be worth getting only these three and using other knives for more specialist things. However, the price may be off-putting, especially as you can get equal quality for less in other brands. In reality, damask steel is now no different in quality from the steel that other high quality brands use and it’s a nice way of saying ‘the highest quality’. The thing is, Richardson Sheffield, Global and Wüsthof also use the highest quality steels as well. These are a pleasure to use and I would highly recommend them. 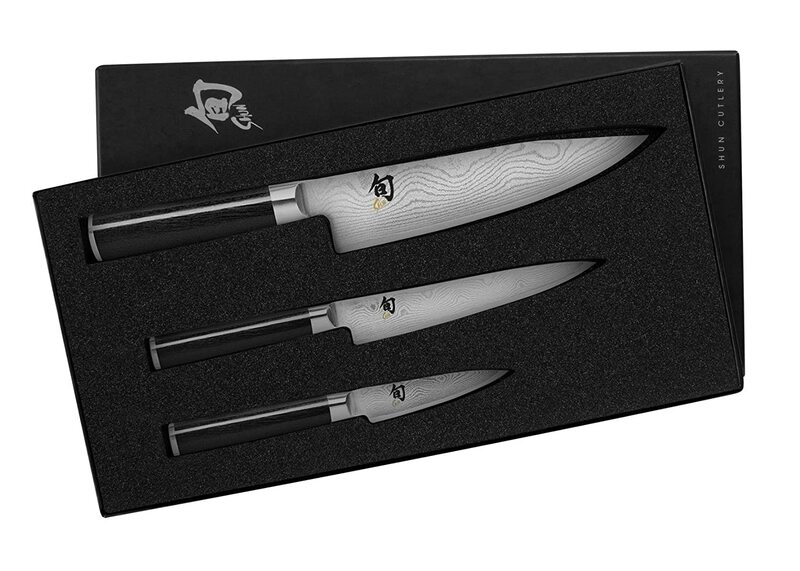 They would make a wonderful gift to a new chef or a fantastic core collection for any kitchen. They are extremely sharp and if looked after will last you a lifetime. In the end, the decision really comes down to style. Personally, I think these straightforward Japanese knives are to be highly prized, regardless of price.